Moth proof sachets. Protects against moths and their hatching grubs. Especially for woollen garments, blankets etc. which moth grubs love to munch on! Leave drawers and their contents with a fresh clean smell. 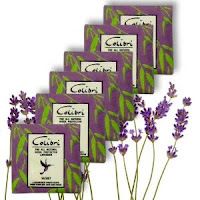 Made with eco friendly packaging and a blend of 15 natural essential oils. 5 x Drawer Sachets. Effective protection for 6 months against moths and other insects.. ... with a fresh, pleasant fragrance. "Divine Smelling" as described by the Independent where they were featured as one of the top 50 household products ever!! Essential oils include Lavender, Lemon grass, Peppermint, Geranium, Margosa and Eucalyptus all infused into a Sandalwood powder. A pleasant safeguard against hatching grubs munching into clothes, blankets, books and other articles. So far, these little sachets seem to be doing the job they were meant for - stopping clothes moths attacking my woollen stuff! They also smell MUCH better than mothballs!